"Dear Liz,I know my father greeted you mother in heaven. Your family has meant so much to our family. Sending love and prayers." "Our prayers and love are with Mary's family. May God watch over you and may she rest in eternal peace. " Mary Gonzalez Flores, age 92, died October 13, 2018, in Arlington, TX where she resided with her family. Mary was married to Rudy Tovar Flores for 48 years; he preceded her in death in 2003. Mary was born in Waelder, TX but lived her childhood in Monterrey, Mexico where necessity forced her to work at a young age. Mary returned to Texas to work as a nanny and housekeeper in her early 20s where she met Rudy, the love of her life. She never attended school but taught herself to read and write in English and Spanish. Mary was a loving wife, mother, and grandmother and subsidized her husband’s income by sewing. She was a devout Catholic and Guadalupana and enjoyed cooking for church events. Memorial Service: 11:00 a.m. Wednesday, October 31, 2018 at St. Cecilia's Catholic Church, 125 W. Whittier Street, San Antonio. Interment: 1:00 p.m. Wednesday, October 31, 2018 in Fort Sam Houston National Cemetery, 1520 Harry Wurzbach Road, San Antonio. She is survived by her daughter Elizabeth Ann Flores-Velasquez and son-in-law Nery Rolando of Arlington, TX, and Michael Anthony Flores of San Antonio. Her grandchildren include Elizabeth Michelle Flores, Roxy Flores, Anthony Pesina (Roxanne), Aldo Pesina (deceased, wife Viviana), Rolando Velasquez, Rodolfo Velasquez, and Moriah Velasquez-Gruetzmacher (Daniel). Great-grandchildren include Anaya, Khloie, Aldo Jr, and Antonio, Jr. Surviving sisters include Margarita Silva of Monterrey, Mexico and Angelina Selby of San Antonio. Mary came from a large family. She is preceded in death by her parents Jose Maria Gonzalez and Maria Delfina Gonzalez, siblings Modesto Gonzalez, Inez Gonzalez, Maria Antonia Salazar, Lupe Gonzalez, and Josefina Rodriguez. 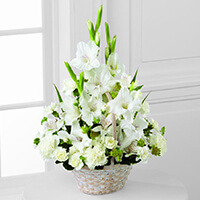 To send flowers to the family of Mary Gonzalez Flores, please visit our Heartfelt Sympathies Store. Sending your wonderful family love, hugs and prayers from all of us. Your family has always meant so much to us, we share your grief. We will always be near if you need anything. Dear Liz,I know my father greeted you mother in heaven. Your family has meant so much to our family. Sending love and prayers. Our prayers and love are with Mary's family. May God watch over you and may she rest in eternal peace.